This is a good time of year to see the Andromeda galaxy. When the sun sets and the sky fades to black, Andromeda materializes high in the eastern sky. You can find it with your unaided eye. At first glance, it looks like a very dim, fuzzy comet, wider than the full moon. Upon closer inspection through a backyard telescope-wow! It's a beautiful spiral galaxy. At a distance of "only" 2 million light-years, Andromeda is the nearest big galaxy to the Milky Way, and astronomers know it better than any other. The swirling shape of Andromeda is utterly familiar. GALEX is the "Galaxy Evolution Explorer," an ultraviolet telescope launched by NASA in 2003. Its mission is to learn how galaxies are born and how they change with age. GALEX's ability to see ultraviolet (UV) light is crucial; UV radiation comes from newborn stars, so UV images of galaxies reveal star birth-the central process of galaxy evolution. GALEX's sensitivity to UV is why Andromeda looks different. To the human eye (or to an ordinary visible-light telescope), Andromeda remains its usual self: a vast whirlpool of stars, all ages and all sizes. To GALEX, Andromeda is defined by its youngest, hottest stars. They are concentrated in the galaxy's core and scattered around a vast ring some 150,000 light years in diameter. It's utterly unfamiliar. "Looking at familiar galaxies with a new wavelength, UV, allows us to get a better understanding of the processes affecting their evolution," says Samuel Boissier, a member of the GALEX team at the Observatories of the Carnegie Institution of Washington. Beyond Andromeda lies a whole universe of galaxies-spirals, ellipticals and irregulars, giants and dwarfs, each with its own surprising patterns of star formation. To discover those patterns, GALEX has imaged hundreds of nearby galaxies. Only a few, such as Andromeda, have been analyzed in complete detail. "We still have a lot of work to do," says Boissier, enthusiastically. GALEX has photographed an even greater number of distant galaxies-"some as far away as 10 billion light-years," Boissier adds-to measure how the rate of new star formation has changed over the universe's long history. Contained in those terabytes of data is our universe's "life story." Unraveling it will keep scientists busy for years to come. For more about GALEX, visit www.galex.caltech.edu. Kids can see how to make a galactic art project at spaceplace.nasa.gov/en/kids/galex/art.shtml. 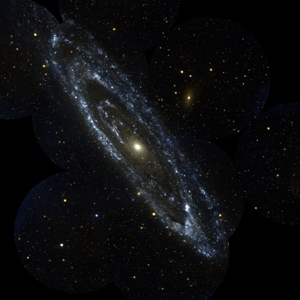 The GALEX telescope took this UV image of the Andromeda galaxy (M31), revealing a surprising shape not apparent in visible light.